More than any other vegetable, growing corn makes me feel like I’m farming — not gardening, but farming. It’s partly because corn is a big plant. It’s one of the few vegetables that stands taller than you. And corn is usually grown in some arrangement of multiple rows so it also takes up a lot of space. This is one of the main challenges to growing corn at home. The typical planting advice is that you make a minimum of four rows. In other words, make a patch, a block of corn plants. But that amount of space might be hard to come by. No matter, this is good advice, and the reason for it is related to how corn is pollinated, that is, how the kernels of corn on a cob are able to grow. Corn kernels are seeds, and these seeds cannot grow unless there has been pollination. Here’s how that happens, or can happen. 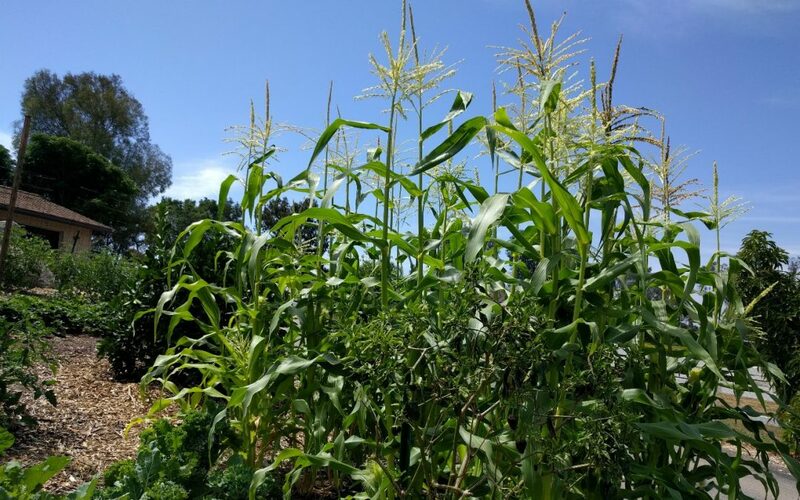 The stages of life that a corn plant goes through, from seed sowing to seed production, illuminates the why and how of getting good corn to eat from our gardens. First, the seed or seedling goes into the soil and we have a little grass plant. The corn plant gets thicker and taller until forming a tassle on top, the tassle being considered a male flower because it produces pollen. When a corn plant is tassling and a breeze comes through, you notice orange dust falling, the orange dust being the pollen. You also notice bees on the tassle collecting the pollen. 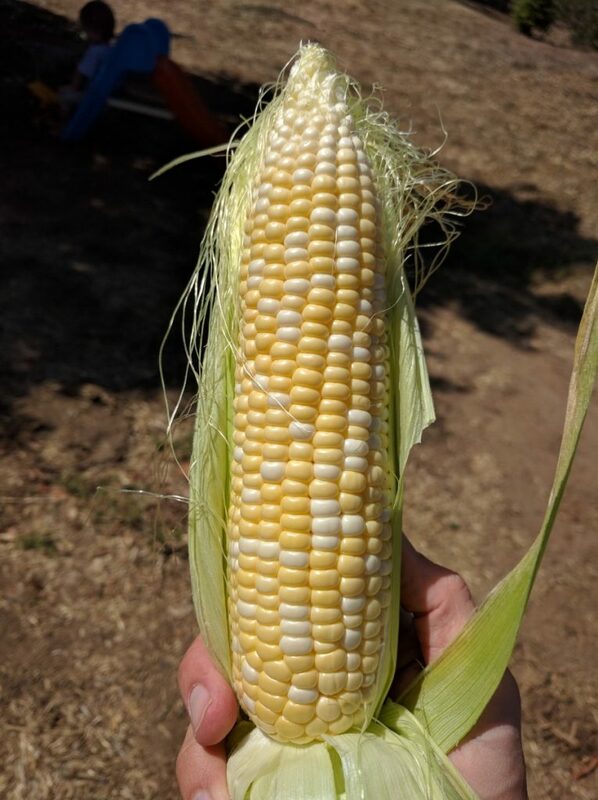 A corn plant makes a tassle on top at the same time that it makes incipient ears along its stalk; you notice stubby branches coming out of the sides of the corn plant and at the tips of them emerge silks, creamy white hairs. A corn plant is built such that its orange dust pollen from the tassle falls down and lands on the silks below. Each of those silks is connected to a tiny cob inside the stubby branch (husk), and if a silk is dusted with the falling pollen then a kernel of corn will grow at the base of that silk. Every kernel of corn on the ear below formed because its silk was pollinated — touched by some falling pollen. Now we can envision why it is advised to plant corn in many rows or a block. Imagine the opposite. 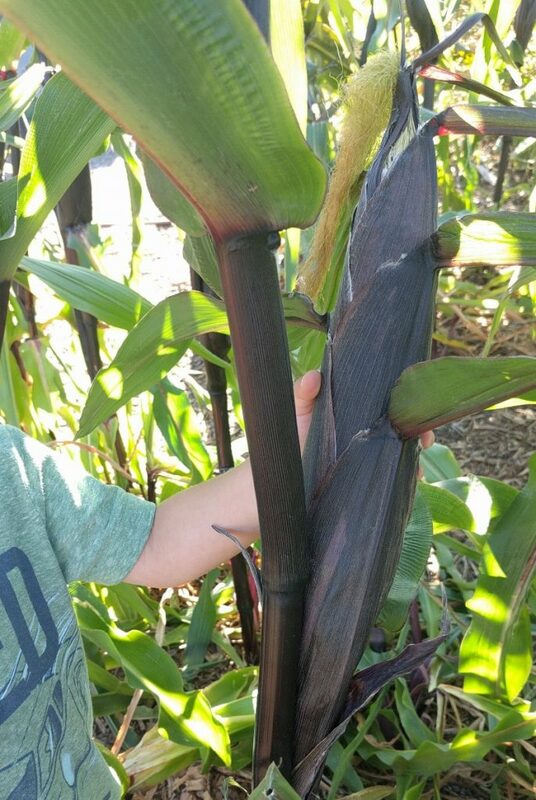 Imagine growing just a lone corn plant. The breeze would come through and pollen would fall, but the pollen wouldn’t fall straight down onto the silks below; the pollen would be mostly carried away by the breeze, away from the lone corn plant. 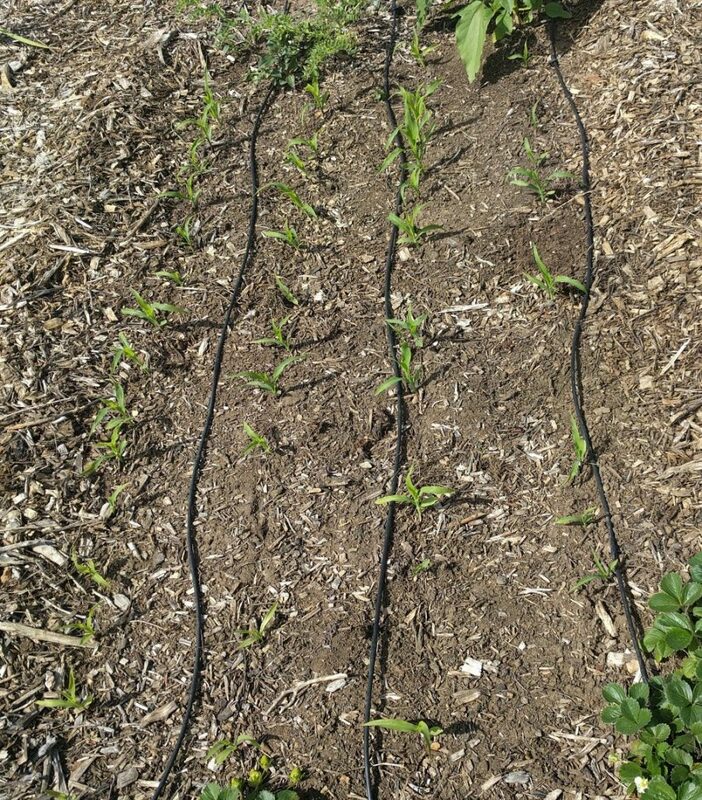 A single row of corn plants is not much better arranged for pollination. Unless the breeze is blowing parallel to the row, the pollen will be wafted away from the plants and their silks. So by planting many rows or a block, you get a bulky area of plants with tassles releasing pollen in the breeze that is able to fall on silks of neighboring plants all around. Then you get ears of corn with good pollination, meaning you get ears of corn that are packed full of kernels. The challenge is that you might not have 25 square feet or more of garden space to dedicate to a corn patch. The good news, though, is that you can still get decent ears of corn without following that standard advice. 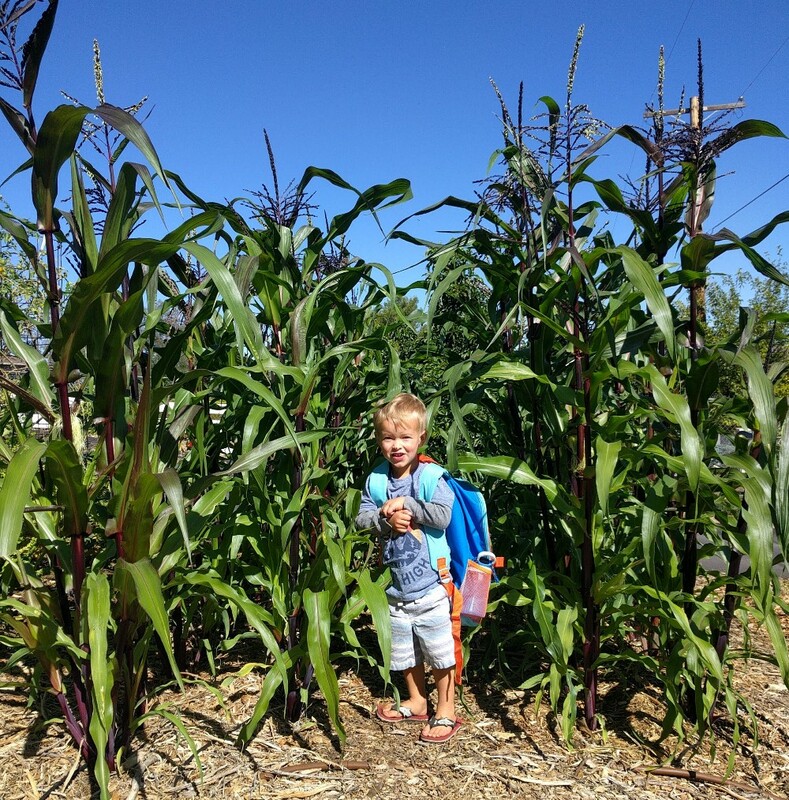 I’ve grown just two rows of corn and gotten decent pollination — the ears were acceptably full. And I once also tried just a single clump of three corn plants. Here it is growing above some honeydew melon vines on the right in the photo below. 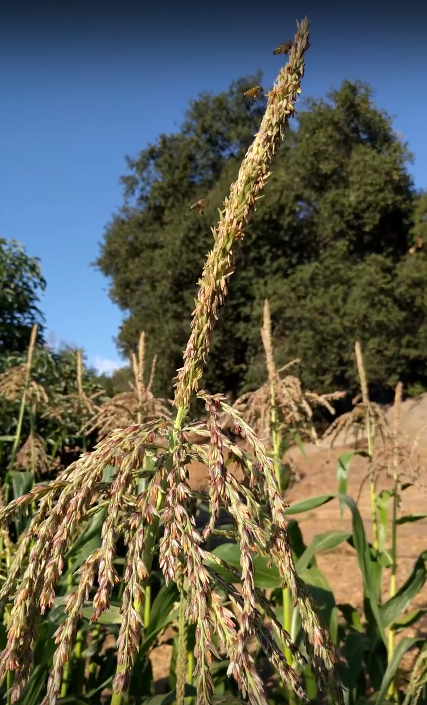 For these corn plants, I noted when their tassles started releasing pollen and I gave them a light shake a couple times a day when no breeze was around to take it away. The orange dust fell down onto the silks. The ears of corn turned out with decent kernel fill. So now I’m wondering how far one can go with this. Can you grow a lone corn plant? Just pollinate by hand, and get a couple of good ears? I don’t see why not. I’m going to try it sometime this summer. Maybe you’ve tried it already? If so, tell me how it went. Because corn is wind pollinated, and because we eat the seeds (kernels) of corn, you can’t plant different kinds of corn near each other without affecting their taste (assuming they tassle at the same time). You must stagger your plantings of different kinds of corn. And there are so many different kinds of corn. I’m unaware of a kind that doesn’t grow well here in Southern California. For fresh eating, follow your taste buds. If you like it very sweet, then grow varieties that fill their kernels with extra sugar, usually called supersweet. Those are often too sweet for me, however, so I mostly grow traditional varieties like ‘Golden Bantam’ or what are commonly called “sugar enhanced” varieties like ‘Delectable’ (shown above). Last summer, I tried pushing my sowing date for corn later than ever before, and I sowed Martian Jewels on August 23. The crop still matured well, and we ate those ears fresh off the stalk starting in mid-November. Usually, I sow corn as early as late February, but March is always a safe starting time. So what I do is plant small corn patches multiple times from about March until August. I sow every month or two and end up growing three or four little corn crops per year. This way my family can eat the whole harvest fresh and there’s no processing work to freeze a big harvest. We don’t live in Idaho; we don’t have a short growing season such that we have to grow all of our corn at once. Corn is easy to grow from seed. Like peas or beans, you just put the seed a knuckle deep in the dirt and — as long as the dirt is thoroughly moist beforehand — you don’t need to even think about the seeds let alone water them until they’re up and growing. I space my seeds about six inches (a little wider than my hand), with an eye toward thinning about every other one in order for the mature plants to be spaced approximately one foot apart. There are always a few seeds that don’t germinate or are weaklings so I try to remove those ones and keep the big and strong ones. Alternatively, you could sow two seeds every foot and then remove the weaker of those two. Everywhere you read that corn is a “heavy feeder” and that you should “side dress with a high-nitrogen fertilizer after four weeks of growth,” but I’ve never seen a reason to follow such instructions. I treat corn just like any other vegetable. 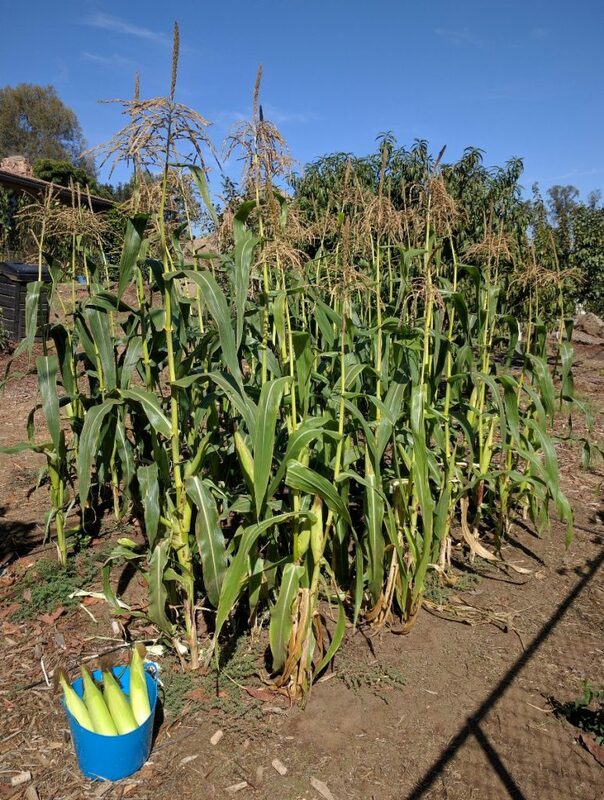 I put an inch or two of compost on the surface of the soil of all of my vegetable beds once or twice per year, and my corn has always grown and produced just fine with that. In fact, one summer I grew a corn patch in an unused area of the yard where only weeds had ever grown. All I did was clear the weeds and sow the corn seeds. I did zero other soil preparation or even compost. The plants looked good and the yield was very satisfactory. Here is that patch at harvest time. What I’m saying is not that corn doesn’t need fertile soil, but that it doesn’t need any extra fertilizing compared to other vegetables, as far as I’ve observed. I do usually mulch under my corn though. After the plants get at least a foot tall, I spread compost or wood chips under them. This is not for soil fertility directly, but more for water retention and infiltration. Corn grows on the same watering volume and frequency as other vegetables until it gets to silk-and-tassle size. At that point, it asks for extra. The leaves will curl in the heat, and the plants won’t produce as well if I don’t add more than previous. 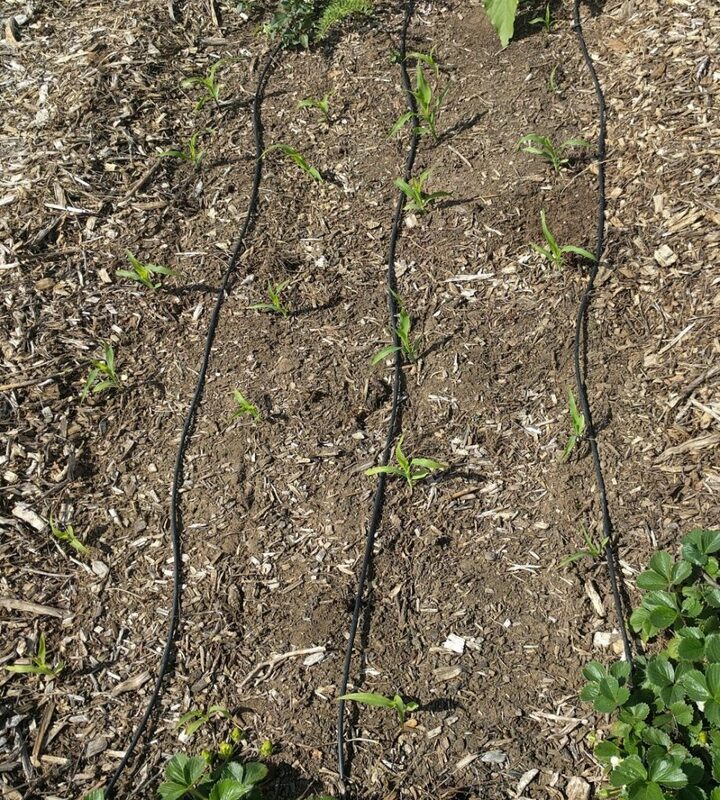 Since I grow my corn on the same drip lines as my other vegetables, I just hand water the corn extra at this stage of their development, and the mulch helps to retain the water and prevent runoff (so I can add water fast). I’ve never experienced a disease on my corn plants, but there are a couple pests that arrive. Aphids sometimes inhabit the husk leaves, and then ants show up to tend the aphids. That’s annoying, but it has never affected the quality of the corn ears so I do nothing about it. Corn earworms are worse. They do actually get into the corn ear and damage it. I do nothing about corn earworms either, however, because the damage is always only at the tip, and at the tip of only a few ears in a crop. I just snap the tip off of those damaged ears. 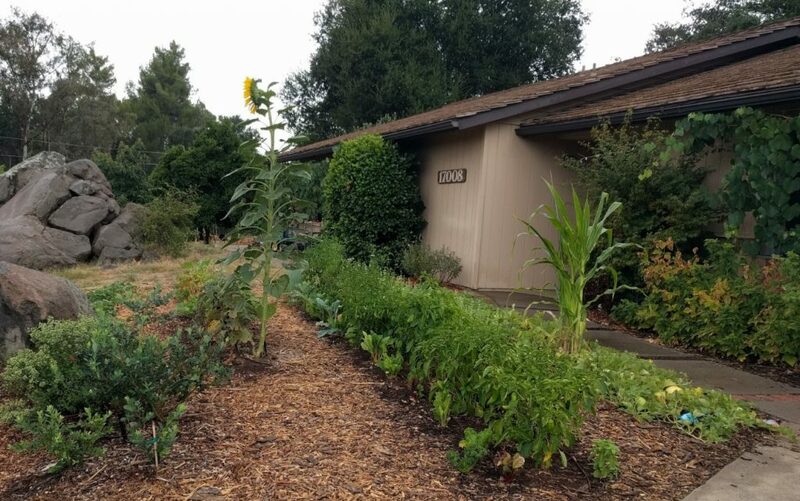 If for some reason corn earworms are more damaging in your garden, I’ve read at the University of California Integrated Pest Management website that Bacillus thuringiensis and Spinosad products are effective. The second main challenge to growing corn (the first was that it’s big and wants a lot of space) is that they’re like watermelons: they’re tricky to harvest at the right time. 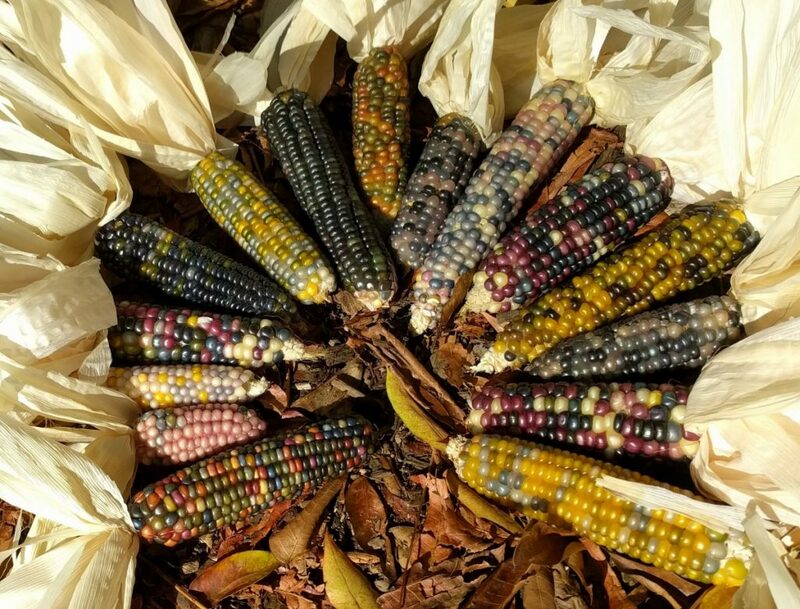 After you’ve grown corn many times, you can just feel an ear and tell if it’s ready (it feels full, plump and yet the husk leaves are still soft and green — or purple in some varieties). But until then, there are some clues to observe and help with a timely harvest. The silks that are showing outside the husk should be brown and dry, especially toward the tips. Once that’s the case, then feel the ear. It should feel filled out. There’s no give because the kernels inside are fattened. Silks are browning, feels full, I’d peel it back and check the tip. Now peel open the tip of the husk. The silks will still be white in there. Peel open just enough to reach the kernels at the tip and puncture one with a fingernail. If clear juice comes out, you’re too early. Eat that ear and it will taste bland. On the other hand, if it oozes pasty, very sticky juice, you’re too late. But if the punctured kernel puts out what looks like milk, then you’re right on time. Break that sucker off with a twist downward at its base, and take it over to the shade of the nearest avocado tree. 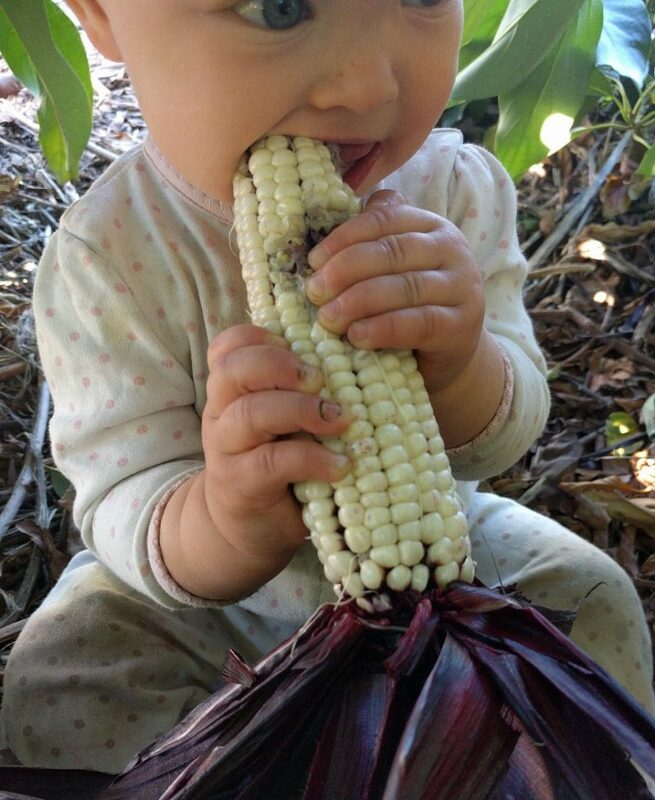 Gumming on an ear of corn is baby heaven. ‘Martian Jewels’ variety. Thank you Greg! Corn is a gift from our ancestors and you remind us not to make it complicated. I’m going to try two rows in my tiny space this year. I had luck with two plants in my greens bed last year and we had about four ears– we called that success! Thank you, Amy. Great to hear you had success with just two plants. 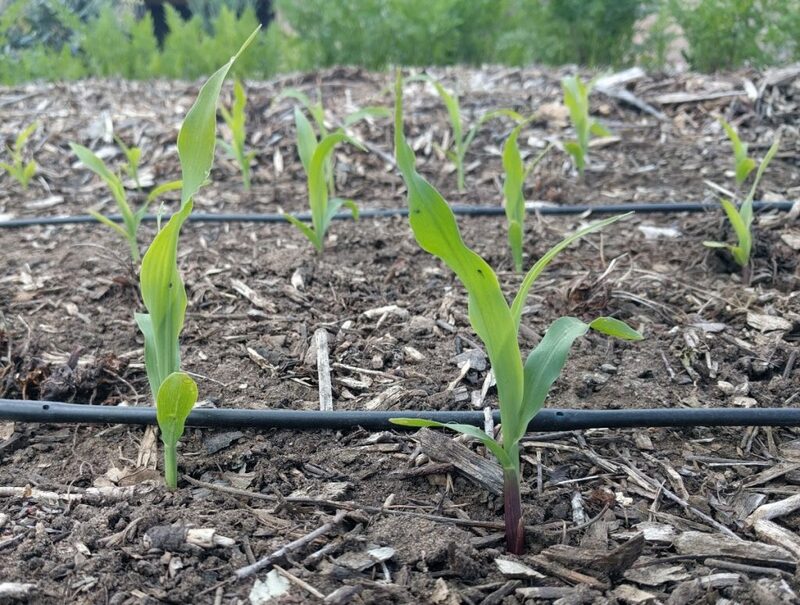 I love the potential of planting just a couple of corn plants multiple times throughout the warm seasons. Greg, your articles are outstanding. You have created a fantastic website that is easy to understand with accurate information written so everyone can understand it all. I really appreciate it! So kind of you to take the time to write that, Richard. Thank you very much. Great post! Glad to know it’s okay corn hasn’t germinated after 1 and 1/2 weeks, and that I don’t have to worry about watering. Question: you said corn should be planted in soil that’s already wet. So what should happen for soil that is wet, but gets muddy and dries quickly? The moisture sinks, and it’s mulched, but should I worry about the corn drying out? Thanks, can’t wait for next post! I think that for your situation right now you should do some excavation. Dig up one of your corn seeds. Find out for sure what the soil moisture around it is like and see if it has started germinating. Sometimes this kind of exercise gives surprising results. For example, you thought you’d sown in moist soil, but it was only moist two inches down. Or, the corn is germinating and about to pop above the soil line and all is well. It is absolutely key to sow into soil that is moist at least a foot deep or to water immediately after sowing in order to wet the soil to at least a foot deep. I prefer the former since you won’t have to worry about seeds floating to the surface while you’re watering and you can dig to check the depth of moisture without disrupting your sowing. Great Post! Question: If corn was planted in a soil that gets “muddy,” and dries out relatively quickly, should it be watered? The soil was mulched, and the water sank. Do you know what kind of soil this might be? Thanks, can’t wait for next post!